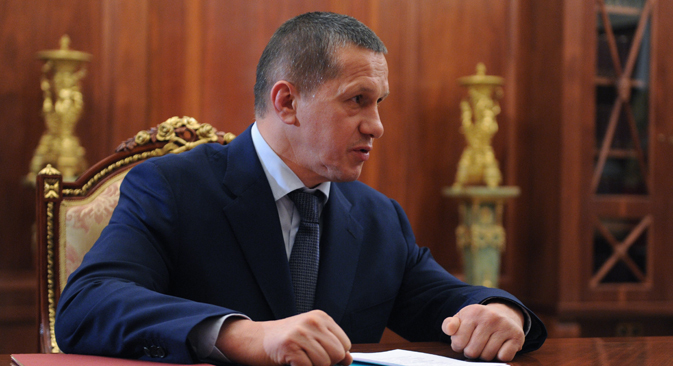 Presidential Plenipotentiary Envoy to the Far Eastern Federal District Yury Trutnev answered questions from the Kommersant Vlast magazine about the prospects for developing the Russian Far East and the opportunities for business cooperation with the Asia-Pacific region. Yury Trutnev: I do not see the situation as you have depicted it. I’ve never been to Japan, but at the end of last year I visited South Korea. I am convinced that Koreans are quite pragmatic, they do not forget about their economic interests. There are projects that work and provide the profit and no one wants to quit these projects. Kommersant Vlast: Aren’t investors afraid of the risks of working in the ruble zone? Y.T. : Why is it a risk? Due to inflation? Well, it is not only a risk to business and it is not an absolute evil. Inflation can be a boon if one can use it skillfully. Unfortunately, almost all countries in the world are focused on a single reserve currency. And it is not surprising that somebody benefits from this. We must fight for our own currencies, fight for our own financial systems. I recently met with leaders of the two Chinese banks - ICBC and China Development Bank. I can only say that the amount of their assets is over $4 trillion. And they are interested in cooperation with Russia. Chinese leaders are very wise and very consistent people. They are not in a hurry, but quickly analyze the pros and cons of the situation, and I do not want to determine their solution in advance. Kommersant Vlast: How are the Chinese negotiating in terms of sanctions against Russia? Don’t they feel like they can afford everything because Russia has nowhere to go, actually? Y.T. : The Asia-Pacific region is a very large area, and there are many opportunities. There are Korea, Japan, Singapore, Indonesia and a number of other economically developed countries, so it is necessary to work with everyone. We said at the start that the past development model - we produce something in the Far East, and then we carry it for 9,000 km to the densely populated part of Russia - is absolutely crazy and simply cannot exist by definition. We must enter the dynamic Asian markets, it’s the only way we can win. Kommersant Vlast: In December you were in China and met with the business community. What are the interests of Chinese business in Russia, what do they expect? Y.T. : Chinese business is interested in cooperation in the energy sphere, wood processing, the construction of infrastructure. We also discussed a wide range of issues related to the development of the Northern Sea Route [from the Pacific to Europe via Russia’s Arctic coast]. Our offer of cooperation in the field of shipbuilding was a new one, but it is clear that Chinese entrepreneurs were interested in it. Kommersant Vlast: How is internal work on developing the Far East going? Isthecrisishavinganeffect? Y.T. : We have taken a big step forward lately. An inventory of joint projects has been held, a law has been signed giving the region the status of a territory for priority development, and a plan of investment support has been prepared, but it is at a preparatory stage. That’s not enough to improve the economy of the Far East, which has an infrastructure saturation 10 times less than the center of the country, despite the fact that the Far East occupies 36 percent of the territory of the country. For the next, fundamental step non-standard measures and solutions are needed. They are being prepared. Kommersant Vlast: What is the concept for this step? Y.T. : There are a number of ideas. For example, a sharp reduction in bureaucratic barriers. To concentrate responsibility for the development of the macro-region in one place. We’re thinking of providing citizens with free land in the Far East. We are confident that such a mechanism needs to be launched. Kommersant Vlast: During the current crisis, all efforts are being aimed at filling the Russian budget. Are you sure you will be able to get concessions for your projects? Y.T. : It seems to me that the situation is very simple. What do we need now? To compensate the income withdrawn from our economy due to lower oil prices. How to do it? To develop other sectors of the economy. In my opinion, this is the only way. We need a new economic policy, we need revolutionary changes in the liberalization of the business environment. We should make sure that people roll up their sleeves and begin to get to work. And concessions are needed if we want to develop new projects, increase the volume of the economy. This article is abridged from the original, which first appeared in Russian in Kommersant Vlast on Feb. 23, 2015.